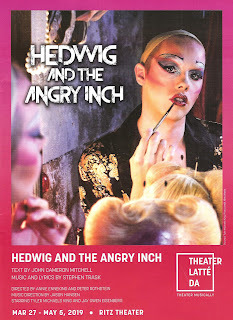 I've been excited to see Theater Latte Da's production of Hedwig and the Angry Inch, starring multi-talented #TCTheater artist Tyler Michaels King, since they announced their season last spring. I've loved Hedwig since seeing the movie in the early aughts, and even more so since seeing her Broadway debut five years ago in the person of Neil Patrick Harris. Even though punk rock isn't usually my scene, I really connect with this queen of the misfits and losers who encourages us all to be ourselves, and reminds us that we are worthy and whole exactly as we are. Latte Da's production captures all that and more - part fantastically fun rock concert, part transformational journey to the self. The piece is co-directed by Artistic Director Peter Rothstein and Annie Enneking, #TCTheater's preeminent fight choreographer and headliner of the rock band Annie and the Bang Bang. Through this perfect combination of Peter's clear vision for music-theater storytelling and Annie's rock star sensibilites, they have created a piece that's epic and intimate, loud and in your face, yet beautiful and touching. This small cast musical includes only two characters, plus the band, and is largely a one-person show. And that one person is Tyler Michaels King. He is so stinkin' talented, and this role allows him to use all of his many varied talents - comedy, drama, improv, physicality, music, and the ability to pretty much single-handedly captivate an audience for 90 minutes straight. He's so fully in it, so real and human, inhabiting all of Hedwig's messy and complicated corners. 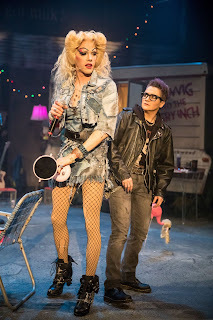 Jay Owen Eisenberg provides wonderful support as Yitzak, not only as Hedwig's wig and prop master, but also imbuing the character with seething resentment and undergoing a transformation of his own. Bewigged Music Director Jason Hansen leads the awesome four-piece onstage rock band on keyboard, all of them decked out in rock star gear and playing the roles as well as their instruments. A fun feature of Hedwig is that because it's presented as a concert, we the audience are part of the show. We're Hedwig's audience and she plays to us directly and includes us in the performance. She fully acknowledges the here and now, including local references and jokes. Don't sit on the aisles or in the front row unless you want to be flirted with; they've built a catwalk coming off the stage which allows even easier access to the audience (which is where Tyler's improv skills come into play). Our language around and understanding of transgender people and gender fluidity has change greatly since John Cameron Mitchel created the character of Hedwig in the '90s. Twenty years later, Hedwig and the Angry Inch is still an important part of that conversation. At a time when transgender people are facing renewed discrimination and violence, Hedwig reminds us that everyone is a unique individual who is worthy of life and love, no matter what body parts they have or whom they choose to love. Hedwig give us all permission to dance to our own rock and roll, whatever that looks like, whatever that feels like, whatever that is. 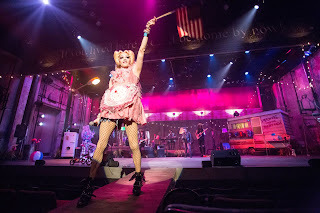 The fabulous transformative music-theater-rock concert experience that is Hedwig and the Angry Inch continues through May 5 at the Ritz Theater in Northeast Minneapolis. **Scenic design by Michael Hoover, costume design by Alice Fredrickson, hair and wig design by Paul Bigot, lighting design by Mary Sabatura, sound design by Alex Ritter, projection and diary artist Noah Lawrence-Holder, projection design by Kathy Maxwell. Tyler Michaels is so amazingly talented and did a wonderful job! However, this feels like a form of blackface. There are plenty of queer actors in town that could have portrayed Hedwig. While audiences might not be aware of Tyler's orientation, if there is one actor in town they might know better than others, it's him. The design, direction, and performances are amazing, but we have to recognize that Theater Latte Da is a leader in our theatre community and we need to raise bar and challenge them to set the example for representation moving forward.